If you are a regular TechCrunch reader, describing a product as a SaaS hybrid of Quicken + Zoho + SalesForce, would paint a fairly clear picture in your mind of the product. And this is pretty much what Soho OS is. Thing is, the odds that their target user bases, small and micro-business, are regular TechCrunch readers, are slim. 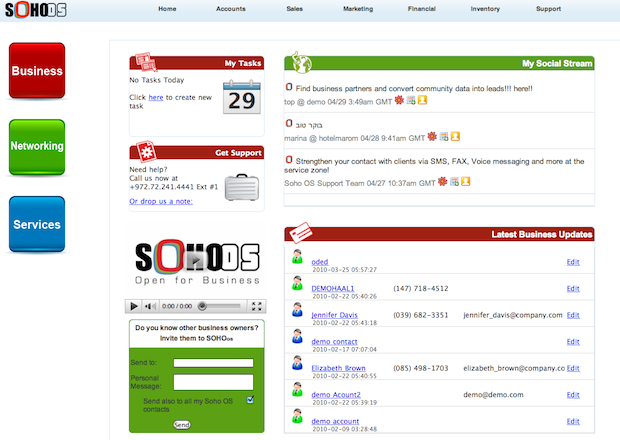 But let’s push the ‘how to succinctly describe the offering’ issue aside, because Soho OS really does offer a well-rounded package of small business management services, from CRM, to invoicing, to VOIP. And it comes at an unbeatable price: it’s 100% free, with a commitment to remain so forever. The founders of Soho OS built it specifically for micro-businesses, with fewer than 10 employees, for example freelancers, design houses, boutique PR agencies, etc . The idea was to provide a number of key businesses utilities for free, with a few premium ones as the base for a business model. Sure, the interface could certainly use a UX overhaul with some American product design sensibility, but this is what Beta releases are for, and a chunk of the company’s next fundraising round has been earmarked for such an overhaul. Once logged-in, users are presented with three main areas: Business, Networking, and Services. Accounts – Account management with shared calendar & email features. Sales – Purchase and sales orders, leads and quotes management. Marketing – Campaign management and tracking. Finance – Bookkeeping and client billing. Inventory – Products management, price lists, vendors and purchase orders, automatic inventory renewal, sales and purchase order alerts. Chat – With internal and external users. Inbox – Including mass email capabilities. Contacts – With multiple tasks such as sending SMS, faxes and voice messages. Text & Voice Messaging – To single contacts or groups. Fax – Both sending and receive. VoIP – Both domestic and international calls. Conference Calls – Perform conference calls. Credit Card Processing – Process and track credit card transactions. 55% use Soho OS 9 times a month or more, 36% use it over 26 times per month. Average use time is 31min per visit. 20% out of the 400 approved beta users (out of 1200 requests) consume premium services. The leading premium service is VoIP followed by SMS and Fax.